We are experienced, reliable and close. We focus on the individual and rely on teamwork. In short, we think sports personally. Your Personal Training: Arrange a free introductory meeting to discuss your training needs now! We are founded on enthusiasm and passion for sports and service excellence. 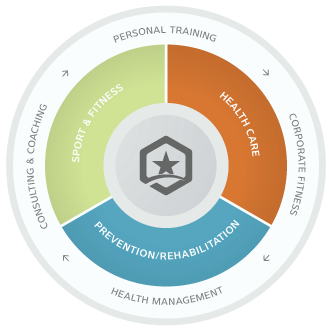 We believe that sports has a positive impact on your health, and that a program designed personally for you helps to unfold those benefits. We strive to understand our clients and their needs with the help of well thought out and personally tailored training concepts. »Thinking sports personally« is the logical consequence of our thinking and our corporate approach. Sports is experienced individually. Personal training is a unique experience and superior to any gym in its personal orientation. Only when specific individual goals and motives are taken into account, training concepts that inspire and are successful emerge: ambitions are achieved, motivation increases and potential unfolds. Thomas Sommer studied sports science and health management, and holds an associate's degree as a Fitnessfachwirt (fitness specialist) from the German Chamber of Industry and Commerce. As a teacher of sports, prevention and rehabilitation as well as an experienced certified sports instructor he has worked for well-known brands such as Puma®, and coached clients for many years in the field of personal training and corporate fitness from all over Germany. In 2011, he founded Wellway Sports and, since 2012, is its sole owner. We intuitively follow a creative and holistic approach in our services which are fully integrated into our business model. Therefore, we work with selected regional partners who consistently support us in this approach.